At the end of August 2018, Slator covered a lobbying effort against a landmark ruling made by the California Supreme Court with potentially industry-wide ramifications for the country’s language services market. 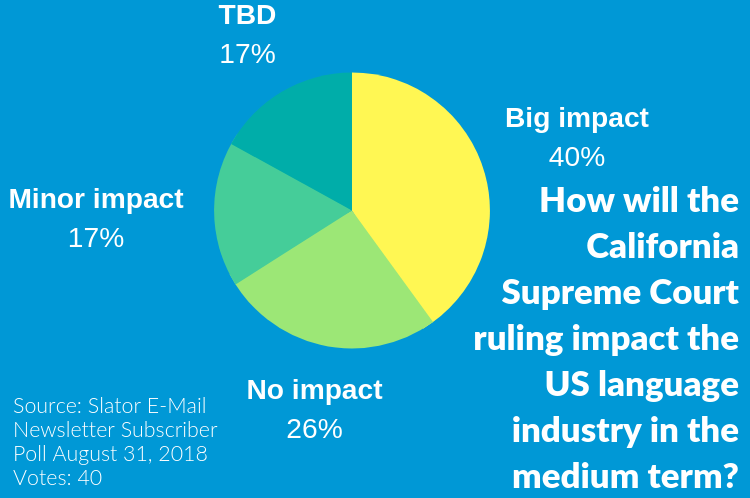 Asked how big of an impact this ruling will have over the language industry in the US, most Slator respondents said it had a major impact. Around a third did not seem to think the same, however, and nearly a fifth of respondents were on the fence pending further developments. Over 40% confirmed they thought it was a good move, though another nearly 40% said “it depends,” with the rest flat out disagreeing. Inspired by the way job site Indeed’s localization team is maximizing localization impact, the question comes at a time when even research standards into language technology are being questioned. 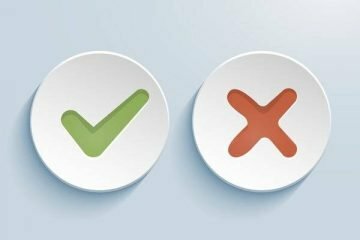 Where Indeed’s loc team (or rather, “Content Effectiveness Team”) merely switches out linguistic translation quality with “content effectiveness as the ultimate measure of quality,” researchers active in neural machine translation (NMT) work are saying existing standards need to change as they are no longer adequate. 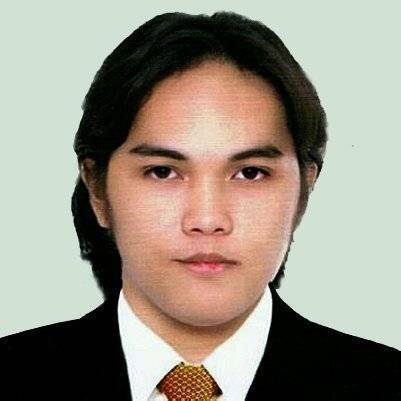 It seems NMT has become good enough at its job that the way the research community “graded” predecessor technology can no longer properly gauge iterative research developments in the age of neural nets—a few papers have called for new quality measures as well as moving from sentence-level to document-level context. These calls are not isolated research papers, either, but more like a mounting movement as NMT research continues to get busier this year. 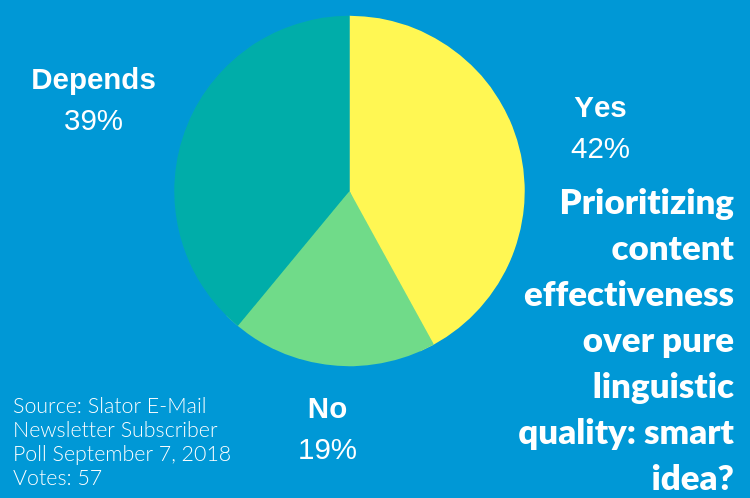 In the area of talent acquisition, Slator subscribers were asked on September 14 whether they thought it had become harder or easier to to find the right localization talent over the past year. Nearly 70% said it had become harder, with only a measly 5% saying it was easier. Nearly a third indicated no change in their perception of localization talent acquisition. Underlying the straightforward question is a number of potential factors, including certain verticals experiencing spikes in demand that are hard to supply, such as the US legal and healthcare interpretation market experiencing a continued spike. The increasing complexity of the market can also play a role. Slator took a look at the language industry from LinkedIn’s perspective, taking a macro look at localization profiles, companies, and pages in the professional social network. A follow-up piece explored the variety of roles and job titles in the industry, and one can see how potentially complicated the process talent recruiters go through to identify exactly what they want from who based on the geography, customer base, organizational design, competitive edge, and even creative licenses of multinational LSPs. In August 2018, Slator launched the Slator Language Industry Job Index. The latest reading was up 2 points from September. 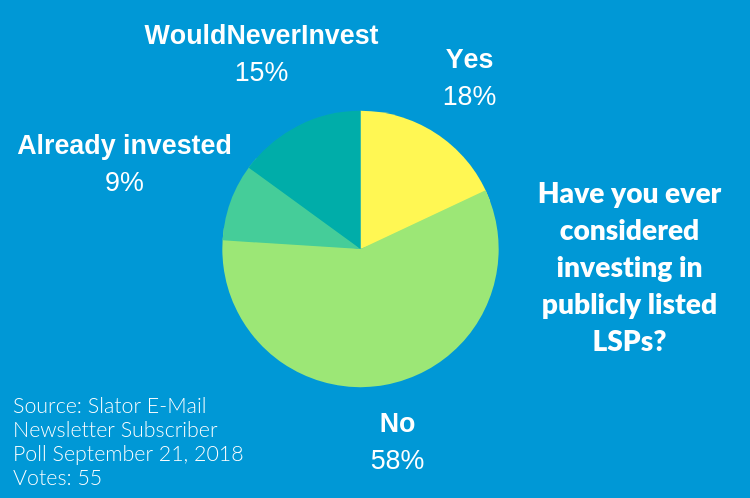 In Slator’s September 21st poll, readers were asked if they have ever considered investing in publicly listed LSPs. Only 9% of respondents were already invested in some publicly traded companies, with majority saying they have never considered it, and even 15% saying they would never invest. The industry does have its share of successful publicly listed companies, and it seems to be on track to get another one. Straker Translations from Australia is on track for a USD 57m IPO, even beefing up its offering ahead of going public by acquiring boutique European language service providers Eule and MSS over the summer. Sign up for the Slator Newsletter and participate in the weekly polls every Friday.